While bonding is sufficient to repair many minor problems, sometimes it is necessary to take a more significant step to correct more serious dental problems. In some cases, this next step involves the use of crowns and bridges. Not only can crowns or bridges repair damaged, stained, or broken teeth, but they can also completely replace one or more teeth that are missing. 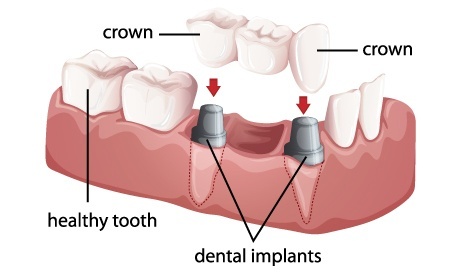 A crown, called a “cap” by many, will be used to cover a tooth completely if it is in need of serious restoration. A crown can replace a larger filling when the damaged tooth has minimal remaining tooth structure. A crown can provide strength to a weaker tooth and prevent fracturing. A crown can restore a tooth that may already be cracked or fractured. A crown can cover a crooked, stained, or misshaped tooth and give it a more natural look. A crown can provide protection for a tooth that has had a root canal. A crown can align a crooked tooth. A crown can provide major improvement to the aesthetic appearance of a tooth. In some cases, multiple teeth have been lost to decay or an accident. In these cases, a bridge may be used instead of a crown. A bridge will fill in the gaps left by multiple missing teeth. A bridge is made up of multiple artificial teeth that are cemented into place using the patient’s remaining natural teeth as anchors of support. This is done for a couple of practical purposes. It keeps the bone structure from dissolving away where teeth are missing. The artificial teeth also improve the aesthetic look of your smile. You can choose from several different metals. The positive aspect of metal is that it is strong and durable. The negative aspect of metal is that it is very visible and does not blend with your natural teeth. Metal works well for children’s baby teeth and for permanent teeth that are less visible. When visible teeth need a crown or bridge, a good choice is a porcelain-fused-to-metal. The exterior shows the more desirable look of porcelain, while the underneath is supported by the superior strength of metal.